After several months of planning, the Long Beach Post is happy to introduce its June 2013 print issue as its first-ever active edition, an innovative new concept in reader engagement that bridges print and digital content to create an entirely new media experience. Using the Aurasma augmented reality app (available for free both on iPhone and Android), stories in a seemingly ordinary print edition come alive with videos, photo galleries, additional information and links to relevant content layed directly over the page in real time. The active edition is just another way that the Post is continuing to explore and embrace technological advances in contemporary journalism, particularly those that make use of our evolving digital world to provide access to additional information. Through this, the Long Beach Post hopes to create a more informed and engaged readership. As the first local news publication to create a full active edition, the Long Beach Post invites you join the experiment by downloading Aurasma and following the Long Beach Post channel. 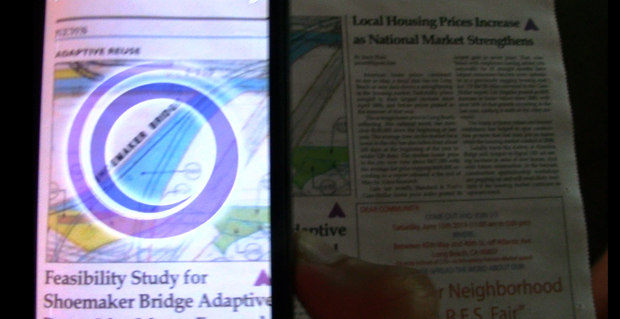 Hover your phone over anywhere in print you see the Aurasma logo and watch it come alive with additional content. View the tutorial above for details on how to get set up with Aurasma and keep an eye out for future active editions where you can delve deeper into the articles you want to know more about. To find a copy of the Post’s print edition, visit lbpost.com/print for drop-off locations. The Post would like to thank developer, videographer and augmented reality guru Bryan Amburgey for helping us utilize this technology.